In 1998 Hurricane Mitch devastated the already fragile Honduran economy and environment. This disaster, combined with the limited government resources available to maintain and research Copan, motivated Honduran archaeologist Ricardo Agurcia Fasquelle and his U.S. colleagues to form the Copan Maya Foundation. Our international team of directors and advisors brings a wide range of expertise to address the unique challenges in preserving ancient Maya world heritage. 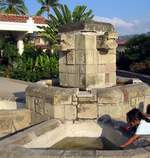 We collaborate with our sister organization in Honduras, the Copan Association, in a variety of archaeological, cultural, community and environmental projects. We also educate audiences worldwide about the Maya through printed materials, conferences, research and the Internet. The foundation offers a tax-deductible way to support Copan. Learn more about the ancient Maya and ensure that this tremendous site will remain for the enjoyment of future generations.